About two and a half years ago, when I made the transition from the corporate world to full time entrepreneur and investor, I started investing heavily in my self-education. Historically, the bulk of my education has been formal (BS in Computer Science and Minor in Economics from Stanford University) and on the job (high-powered executive roles at successful Silicon Valley technology companies). However, one day while watching Tai Lopez on YouTube, it hit me: I need to be investing (heavily) in my self-education via books. Time is scarce, but I need to make the time, I need to do it. So, I started reading and eventually discovered Mentorbox. (If you’ve been reading PPC Ian for a while, you know that I love Mentorbox and have thrived under that program, reading two books per month.) However, before Mentorbox was even invented, Tai Lopez brought me to London Real. I wanted to learn more about Tai Lopez, this man who reads a book a day. I wanted to find out what he’s all about. So, I searched and found that Brian Rose interviewed him (several times) on London Real. Upon finding the London Real YouTube Channel and the London Real Academy, I was immediately intrigued. After enjoying London Real’s extensive free content for quite some time, I decided to sign up for the London Real Academy. Today’s post is a review of my personal experience. It covers exactly what this exciting program offers. Let’s start with the man behind London Real. Mr. Brian Rose is an ex-banker, based out of London. US-born and educated, Brian left the US to pursue his banking career in London. Eventually, he achieved incredible success, but knew something was missing, he knew that banking was not his forever path. So, he took the entrepreneurial plunge and created London Real, a platform that educates others (like you and me) via interviews with the most interesting and brightest minds in our world. A YouTube-centric business, London Real offers new interviews with amazing people each and every week, for free. Brian typically offers the first half of each episode on YouTube. Then, if you want to enjoy the rest, you can head over to his website (it’s free), and watch there. If you’ve been following PPC Ian for a while, you know that I enjoy Mentorbox because the program curates the books for me. I love the element of surprise, I enjoy the diversity and unexpectedness of the titles chosen. In a similar fashion, Brian’s interviews are truly diverse. One week, he could be interviewing British boxing legend, Chris Eubank Sr. The next, he might be interviewing Alex and Mimi Ikonn, entrepreneurial leaders and creators of The Five Minute Journal (also one of my favorites). I’m a big believer that the best lessons come from unexpected sources. Without London Real, I would have never known some of these leaders. I would have never listened to their wisdom. London Real curates a diverse set of the best and brightest mentors out there, imparting their life lessons and wisdom. How amazing! When I first got introduced to London Real via those Tai Lopez interviews, I enjoyed the program for free, for months. The amazing thing about London Real is it’s free. A huge wealth of knowledge is there for anyone, and that’s why Brian’s YouTube channel has so many subscribers. As a side note, this business model really resonates with me. As a YouTuber myself, one that aspires to help as many people as possible, I do believe in the power of offering free content. My education from London Real has helped on my own broadcasting journey. One day, after learning so much for free, I decided to pay and give the London Real Academy a chance. More than anything, I viewed this as my opportunity to pay Brian Rose for his hard work. Regardless of what the Academy had to offer, I wanted to step up and say, "thank you". Of course, the London Real Academy exceeded my expectations. Early access to upcoming London Real episodes. Brian uploads his latest work, before he’s had a chance to fully edit for general release. This is my favorite benefit of the Academy, and I enjoy the early access videos weekly. This alone is a huge benefit that pushes my self-education to the next level. Access to the exclusive Facebook Group of like-minded entrepreneurs and individuals taking their lives to the next level. London Real attracts some of the coolest people around. While I haven’t made full use of the Facebook Group, I see this as an asset that could truly help during my entrepreneurial journey. Weekly challenges (based on best practices from those interviewed on London Real) that push my comfort zone. Being an entrepreneur is all about challenging one’s comfort zone, and the London Real Academy provides a great platform for getting in the right mindset. Bonus content such as Dan Pena’s exclusive seminars at the Ritz. The True Geordie: When I first saw the thumbnail for this episode, I didn’t know what to expect. I saw a big, strong guy with tattoos. I assumed that he must be here on London Real to talk about weight lifting. How interesting that The True Geordie is one of the must successful YouTubers around, someone who literally started with nothing. His story is so incredibly motivating, and I have since become a True Geordie fan and follower. This is a quintessential example of how London Real connects me with amazing people who I would have never known about otherwise. Chris Eubank Sr.: Another interesting one, I was not sure what to expect since I’m not big on watching sports. Being a British boxing legend, I assumed that Eubank would discuss his craft. And, he did. However, his message is so much larger! I learned about the importance of impeccable speech. Moreover, I learned a multitude of philosophical lessons on life itself. Mr. Eubank is a true student of life and taught me that, "Genius is obsession in one area." Dan Pena: London Real also connected me to this interesting businessman who lives in a castle in Scotland. While he may come across a little strong at times and I don’t always agree with the language that he uses, Dan’s message sure is important: Get up and get stuff done. A no-nonsense kind of guy, Dan encourages everyone to be their personal best and push their limits. He argues that most of us are barely scratching the surface of our potential. Alex and Mimi Ikonn: The Five Minute Journal literally transformed my morning (and nighttime) routine. I love this journal and it makes my life so much more fun, productive, and exciting. I also regularly gift The Five Minute Journal to friends, family, and business colleagues. I would have never known about this amazing journal if it were not for London Real. More than that, the episodes with Alex and Mimi have helped shape my perspectives on life and entrepreneurship. They are amazing! Tai Lopez: When people see Tai Lopez in his garage with Ferraris and books, some are immediately intrigued. Others are immediately skeptical. You’ve seen his "in my garage" video, right? As a marketer myself, I truly respect Tai’s methods of attracting people to his message, because his message is empowering and needs to be heard (read more books and find mentors who can elevate your game). 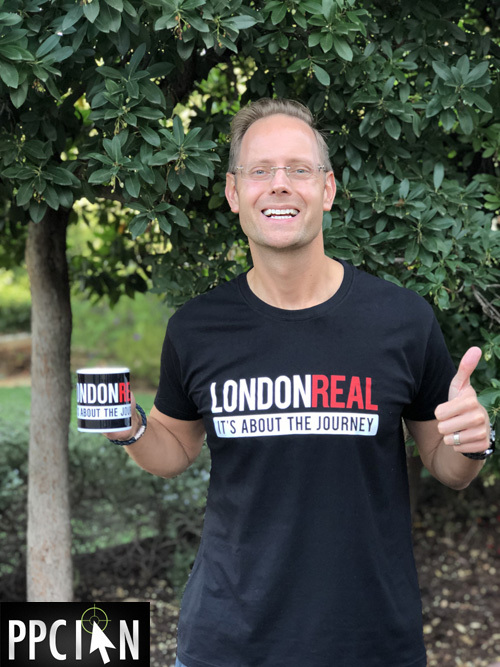 The London Real interviews with Tai Lopez provided a traditional, interview-based forum to really get to know the man who reads a book a day. These are some of the first London Real episodes that I enjoyed, and I’m still a Tai Lopez fan to this day. Dorian Yates: I am very familiar with Dorian Yates, and most men who grew up during my generation are too! A legendary bodybuilder, Dorian’s interviews showed me the power of "going into the lab". Unlike some of his United States counterparts, Dorian did not live a flashy lifestyle. To the contrary, he was all about keeping a low profile and hard work. At times, he would isolate himself to fully focus on his craft. In life and business, this mentality can truly help at times, and I really enjoyed Dorian’s episodes on London Real. London Real, in addition to their Academy, now offers Accelerators. These premium courses offer the student a one-on-one opportunity to partner with Brian and his team on specific areas of life. So far, Accelerators offered include the Business Accelerator, Broadcast Yourself Accelerator, Life Accelerator, and Public Speaking Accelerator. While I have not had the chance to try a London Real Accelerator yet, I hope to at some point in the future. While these are more expensive courses, they offer the ability to really take one’s game to the next level (in a huge way). I wanted to close out by thanking Brian and the London Real team. My experience has been truly wonderful and London Real has been a truly important piece of my self-education puzzle. London Real has also played "connector" role in leading me to other sources of information (and people) who have helped me tremendously. I am so excited about the future, because I know that London Real will keep evolving and getting better. A closing tip for everyone reading: This weekend, instead of watching your normal TV programs with friends and family, consider London Real instead. It will teach you new skills, give everyone topics to talk about and debate, and elevate everyone’s game! Affiliate Disclosure: Right now, there is no affiliate program (to my knowledge). However, I hope to be an affiliate of London Real at some point in the future.